Ultra-accommodative money policies are disappearing from view in the investment landscape, and interest rates are steadily creeping upward in the US. Europe is also likely to see rates begin a slow rise at some point in 2019 or 2020. The next credit cycle is evolving as you read this, and investors will require an innovative approach in order to seize opportunities as each stage unfolds. As a result, investors are looking for innovation – forward-looking solutions – that are flexible and built specifically to address the goals of investors seeking attractive yields. 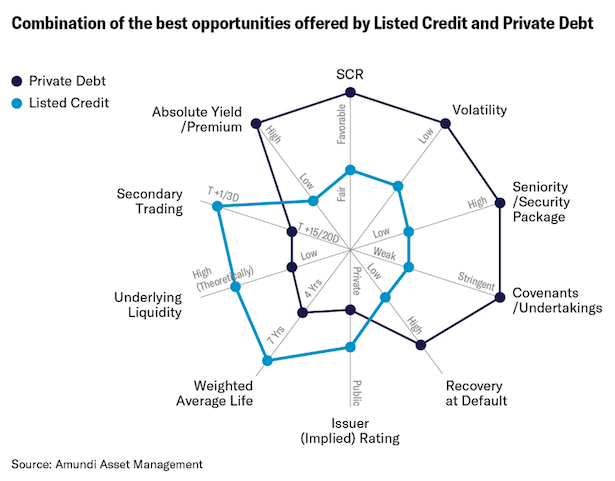 By leveraging its fixed income expertise and global perspective, Amundi is redefining the way investors view credit, broadening their scope to create a credit continuum. It’s important to concentrate on the meaning of continuum, i.e. a continuous sequence where adjacent elements don’t differ all that much, but the more extreme the gap between two spots on the continuum, the more distinct they are. “The credit continuum approach disrupts traditional practices and transcends siloed organisations, to deliver bespoke solutions with risk-adjusted yield targets,” says Amundi’s global CIO Pascal Blanqué. In short, it’s the ideal view for spotting potential across the entire spectrum of credit opportunities, ranging from liquid corporates (both investment grade and high yield), to less liquid assets such as private debt, structured finance-related debt, and securitised assets. “In particular, private debt offers investors an excellent way to diversify their fixed income exposure, allowing them to mitigate both duration and credit risks, which is particularly relevant in the current financial market environment” states Thierry Vallière, head of private debt, Amundi. Investment teams’ governance is a key feature of the credit continuum approach. For a credit continuum to be successful in its implementation, it is fundamental to nurture the cross-fertilisation of ideas across investment teams and to make sure that research and analysis capabilities are shared, along with investment tools, by all credit investment teams. Globally, the rising rate environment in the US and the low rate environment in Europe requires a holistic strategy to find opportunities amid their lack of synchronisation. Eurozone growth has begun to decelerate but remains strong and broad-based. Across the Atlantic, hedging costs for US dollar-denominated bonds are elevated in a rising rate environment. In that context, portfolio construction is critical. According to Amundi’s head of fixed income, Éric Brard, by investing through the whole credit spectrum, the credit continuum has access to floating rate instruments, which significantly reduces duration risk. Picking the optimal instrument and best allocating it across the wide-ranging available submarkets requires permanent monitoring of the constantly evolving liquidity of each segment,” adds Jean-Marie Dumas, head of alpha fixed income solutions, Amundi. To fully capitalise on the potential of the credit continuum requires rigorous work by an asset management team, which must pay attention to each step of the process - from the investor’s risk/return profile - to portfolio construction and active investment. Dumas believes tracking the most sensitive bucket to a credit event within the portfolio must be part of the process an investment manager puts in place in such an investment framework. “In particular, it is necessary to apply stress tests and operate a constant monitoring in order to decide whether to exit or not, and at what price,” says Dumas. Market pricing is viewed as a key driver of realised performance in the credit continuum, and that performance is driven by credit selection capabilities and momentum execution, all underpinned by fundamental and quantitative research that assesses the strength of each credit instrument. Working through the credit continuum naturally leads to the development of new tools and methodologies to exploit new discoveries. These new tools and methodologies are the means by which theory is transformed into practice. In the context of the current financial markets, the credit continuum strategy is only at its beginning, but the pillars of its success – achieving the expected overall outcome – align with Amundi’s expertise across the entire tapestry of fixed income, from investment grade bonds to private debt. *This 'cobweb' graphic illustrates how the credit continuum could take advantage of a flexible allocation between listed credit and private debt assets. The capacity to re-allocate among credit sectors and sub-segments provides increased robustness of portfolios in times of uncertainty. This document is not intended for citizens or residents of the United States of America or to any «U.S. Person», as this term is defined in SEC Regulation S under the U.S. Securities Act of 1933. Amundi accepts no liability whatsoever, whether direct or indirect, that may arise from the use of information contained in this material. Amundi can in no way be held responsible for any decision or investment made on the basis of information contained in this material. The information contained in this document is disclosed to you on a confidential basis and shall not be copied, reproduced, modified, translated or distributed without the prior written approval of Amundi, to any third person or entity in any country or jurisdiction which would subject Amundi or any of “the Funds”, to any registration requirements within these jurisdictions or where it might be considered as unlawful. Accordingly, this material is for distribution solely in jurisdictions where permitted and to persons who may receive it without breaching applicable legal or regulatory requirements. The information contained in this document is deemed accurate as at 30 November 2018. Data, opinions and estimates may be changed without notice. Our latest Marquee award write-ups reveal how Hermes EOS scooped our new prize for the best ESG strategy adviser and what impressed about Amundi's business development this year.